Tea Tree Oil For Acne - Does This Treatment Option Actually Work? Tea Tree Oil For Acne – Does This Treatment Option Actually Work? If you suffer from acne, you might have tried countless aggressive methods to rid your skin of spots, oil and congestion. But have you considered tea tree oil for acne? It’s one of the most natural remedies out there, and can have dramatic effects when you incorporate it into your skincare regime. Tea tree oil has natural anti-bacterial properties that make it the #1 tool in acne treatment and prevention. Tea Tree oil has been used in medicine throughout history, and has been scientifically proven to help cure acne. 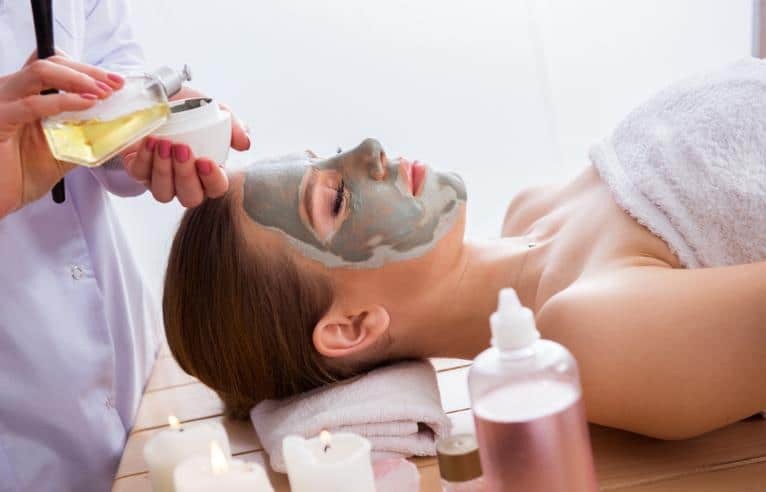 There are countless products out there that contain tea tree oil for acne treatment, and you can also create your own DIY masks to help fight acne. If you are wondering how tea tree oil for acne is such a good treatment, or how to start using it in your skincare regime, there’s a lot of information out there. We have put together a handy guide outlining how tea tree oil can cure acne and the different ways you can use it. Here’s how to use tea tree oil for acne treatment to get clear and glowing skin. Acne occurs when our skin’s openings for hair follicles get clogged and plugged by oil secretions from our oil glands. Nearly everyone will suffer from an outbreak of acne in their lives – from teenage years to adult hood. But not many of us are actually well informed about what acne is and how it is caused, which means we’re woefully underprepared when it comes to treating it. Acne occurs when our skin’s openings for hair follicles get clogged and plugged by oil secretions from our skin’s sebaceous (or oil) glands. When these openings get plugged up, blackheads and whiteheads can appear. 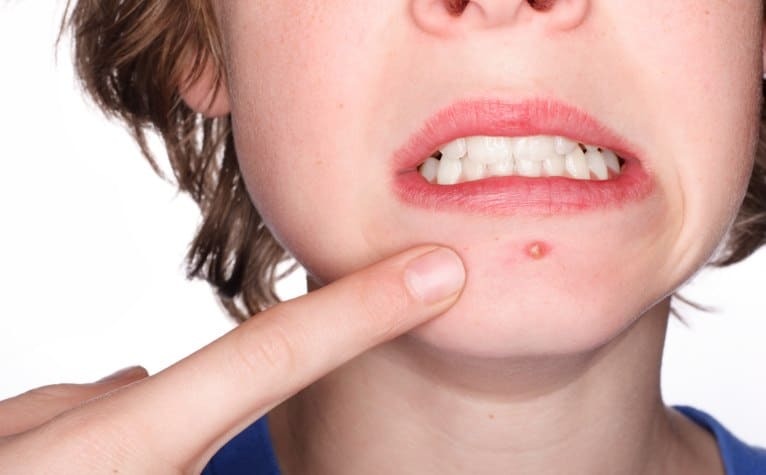 Left untreated, both whiteheads and blackheads can eventually develop into inflamed lumps and pimples, or deep lumps under the skin. Acne in adults can have a number of causes, though not all of these are scientifically understood. There are a few main culprits when it comes to acne, such as hormones –more specifically, male hormones called androgens. The production of androgens signal to the body to create more sebum, or oil, which makes it easier for follicles to get clogged. Stress can also make acne worse, as it’s one of the major sources of hormonal fluctuations, as well as consuming too much sugar. When we consume a lot of sugar, it raises the insulin levels in the body, which has been proven to boost those androgen hormones. If you’re using the wrong skincare products, these can also clog your pores and make your acne worse – and that goes for going too hard on the cleansing too. Drying out your skin and cleansing too much can cause the skin to produce even more oil to overcompensate the dryness. Tea tree oil for acne treatment is a great natural product that won’t over dry the skin. If you’re not well versed in your essential oils, you might not know what tea tree oil is and how tea tree oil for acne can be a useful remedy. Tea tree oil is an oil derived from ‘Melaleuca alternifolia’, an Australian plant. This plant is a member of the Myrtaceae family, which contains almost 250 plant species which are native to Australia. Tea tree oil is the natural alternative to benzoyl peroxide for treating problem pimples. Tea Tree oil is a common ingredient in topical treatments for skin infections. It’s mainly sold as an antiseptic or an anti-inflammatory to consumers – which is why many skincare brands use tea tree oil for acne fighting products. It can also be found as an ingredient in a number of different products. You can find tea tree oil in anything from laundry powder to shampoo. Tea tree oil is a very popular essential oil as it is a powerful disinfectant while still being gentle on the skin. The main active ingredients that are present in tea tree oil are monoterpenes, sesquiterpenes and hydrocarbons. These are the ingredients that work to make tea tree oil so antibacterial, and what make tea tree oil for acne such a good treatment. There are over 100 different components of tea tree oil, but it’s the hydrocarbons that are capable of impregnating the skin’s membrane and work to fight skin conditions such as acne. The use of tea tree oil in healing goes back as far as the indigenous Bundjalung people of Australia. They are said to have used tea tree as a traditional medicine, in a number of different ways. They would use it to treat respiratory issues by inhaling the oils, heal wounds and stings by applying the leaves onto the skin, or make tea from the leaves and ingest it. The plant gets its name from Captain James Cook, who witnessed the Bundjalung people use the leaves to create their healing teas. The area where tea tree trees are mostly grown in Australia is called ‘Bungawalbyn’ which literally translates to ‘healing ground! Tea Tree oil moved into mainstream medicine around the 1930’s, after Arthur Penfold published a series of papers detailing tea tree oil’s antibacterial properties. Shortly after these papers were published, the tea tree industry began. By harvesting the Melaleuca Alternifolia plants by hand, and distilling them in wood-fired stills, the oil was produced. Tea tree oil quickly turned into a household product, and was used as a remedy in homes, and when Australian soldiers fought in World War Two, the oil was a part of their first aid kit. Nowadays, tea tree oil is available around the world, and is highly regarded as a medicinal and anti-bacterial ingredient, especially in skincare, and tea tree oil for acne prevention and treatment is a popular product. So, what makes tea tree for acne treatment so good? The main benefit for acne prone skin is that tea tree oil does not contain any harsh or strong chemicals that can be too aggressive and harmful to your skin. Tea tree oil is created by distillation of the tea tree plant leaves, meaning that zero chemicals or additional ingredients are added to the finished product. The other reason why tea tree oil for acne is a great remedy because of its antibacterial properties. When you put it on your skin, tea tree oil works to kill and fight bacteria that feed on sebum, then produce waste products that can cause the inflammation and infections that eventually leads to acne. This antibacterial property is called ‘terpinen-4-ol’, which allows these types of bacteria to be killed. This natural antibacterial property makes using tea tree oil for acne a great alternative to other more aggressive treatment, such as medications which may have side effects or a negative reaction in the body. It can also prevent future breakouts due to the antiseptic properties. As tea tree oil can penetrate the skins outer layers, it can disinfect the skins pores to stop acne forming, and remove dead skin cells, which can contribute to clogged pores. While it’s doing this, it doesn’t dry out the skin’s natural oil, which helps balance the skins oil production, preventing further acne breakouts caused by skin over producing oil to overcompensate for dry skin. There are a number of studies that prove the use of tea tree oil for acne has a positive result. In 2007, scientists carried out a double-blind placebo, with 60 patients. Half were treated with tea tree oil gel, and half with a placebo. The results showed that patients who received the tea tree oil showed greater improvement in their acne than those with the placebo. In 1990, a group of Australian researchers from the Royal Prince Alfred Hospital studied a group of 124 patients. Half were given tea tree oil as an acne treatment, and half were given benzoyl peroxide. 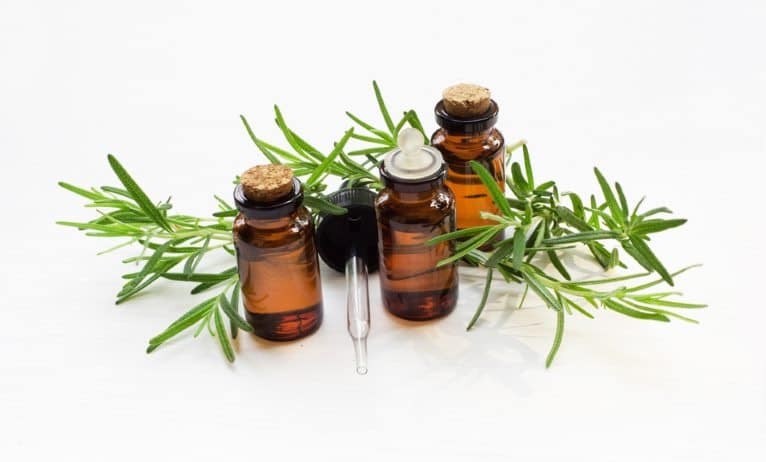 While both treatments worked to reduce acne in the patients, the researchers found that the tea tree oil worked slower, but with no side effects, unlike the benzoyl peroxide. Exposed Skin Care is one of the best brands out there for fighting against acne. They combine natural acne fighting ingredients like tea tree, as well as other ingredients like benzoyl peroxide for the best results. The addition of tea tree oil to these formulations helps the skin stay calm, and benefits from its antibacterial properties. One of the key products in fighting acne is the ‘Acne Treatment Serum’, which contains tea tree oil to kill acne causing bacteria. If you want to learn more about Exposed Skin Care, we recommend you read our review. Another great product out there is the bareMinerals Blemish Remedy Concealer. If you suffer from red and prominent acne, you might cover it up with heavy makeup day after day. This can actually make your acne worse, as you are clogging your pores with heavy formulations. A cover up that contains active ingredients that fight acne, such as tea tree oil is a great compromise if you’re not ready to go barefaced just yet. bareMinerals Blemish Remedy Concealer features tea tree oil as its main ingredient, so it’s fighting acne while still providing enough coverage to hide unsightly red bumps. Customers have stated it’s a great product for more sensitive acne prone skin, as it doesn’t irritate. bareMinerals is a mineral based makeup range, which means that it allows the skin to breathe. The reviews of the product praise its acne fighting ability, with many customers stating it’s helped clear their acne, and covers up well without clogging pores, and praising it’s easy to carry design. However you’ll have to be careful in matching your shade, as some reviews state that it’s not easy to match to their skin tone. For a pure tea tree oil, you can incorporate into your skincare regime, try ArtNaurals 100% Pure Tea Tree Essential Oil. It’s 100% pure tea tree oil, so there are no other ingredients that could potentially cause side effects. They recommend to dilute the oil with a carrier oil or water for the best results, as undiluted the oil can be too strong for the skin. When you’re mixing a pure oil, a dilution of 1% is best, but you can use up to 3% for use on the body. Mix 1ml of this tea tree oil to 100ml of your carrier oil for the best results. As it’s pure tea tree oil, if you wanted to use this oil for additional uses, you can. It’s a great massage oil, as it has a soothing effect on the skin. You can also mix it into your moisturiser, night cream, cleansers and toners for an additional acne fighting boost. Customers have raved about its antibacterial properties, and like how it’s adaptable for additional uses, and love its value for money. For a targeted blemish gel, Thursday Plantation Tree Blemish Gel is a strong contender. It contains tea tree oil for acne fighting properties, and penetrates deeply to dissolve clogged pores. It’s an invisible gel, so it’s perfect for use under make up, or throughout the day. It can be used under other skincare products for layering, and you only need a small amount due to its concentrated properties. Customers have found it an effective treatment for acne and blemishes, after using it twice a day for noticeable improvements, although be careful if your skin is sensitive, as customers have also said it can irritate the skin if overused. It can start showing results in fighting acne as soon as after two days! This is a great product if you want a quick and easy acne fighter, without additional ingredients that could harm the skin. For dryer skin, a moisturiser with tea tree oil may be the best option to fight acne. Era Organics Tea Tree Oil Face Cream is specially formulated to fight adult oily, acne prone skin. It contains antioxidants and natural ingredients including Tea tree oil, St. John’s Wort, Pomegranate Seed Oil, Salicylic, Zinc, Burdock Root, Dandelion Root & Goldenseal. It comes in a creamy formula so to not dry out the skin, leaving it soft and blemish free. This is a great product if your acne is caused by the skin over producing oil due to dryness, as it works to keep your skin hydrated, normalizing the levels of oil products. It also contains salicylic acid, which works to fight acne alongside tea tree oil, both targeting spots and sanitising the skin. It’s a product to use if you want results, as the reviews show that it’s a great product for fighting acne. Customers rave about how it has changed their skin, and their lives by fighting their acne. One customer states “I waited a week to post this to make sure, though we saw 80% improvement in severe acne, literally, in THREE DAYS. I am shell shocked.” – so you can expect improvements in a number of days! One of the best things about using tea tree for acne prone skin is that it’s so adaptable. Essential oils like tea tree are great for making your own DIY at home treatments, and by adapting certain ingredients you can make a treatment for any skin type, and adding tea tree oil will give it acne fighting properties. There are hundreds of combinations you can concoct to make a skin saving face masks, but here are our favourites for each skin type. Tea tree oil as an added ingredient for face mask adds antibacterial and anti-inflammatory properties, making it great for skin issues like acne. This DIY mask is really quick to make. You’ll just need 1 drop of tea tree oil and a spoon of honey. Honey works well with tea tree oil to fight acne, as it’s also got natural antibacterial properties, as well as being an anti-inflammatory. This mask is perfect for both treating acne, and soothing inflamed skin, improving your complexion by clearing redness. Simple mix the tea tree oil and the honey together using a spoon. You can use the spoon to apply the mask in a thin layer onto clean skin. Leave this mask on for 10 to 20 minutes, then rinse with hot water. You can do this mask up to three times a week for the best results. If you have oily skin, you need to be careful with what you put on it. The aim is to reduce the excess oil production, without disrupting your skin’s natural oils – these keep your skin hydrated and an imbalance of this can lead to even more oil production and damaged skin. A facial clay is the best ingredient for this, especially bentonite clay. This works to pull toxins and dirt away from the skin’s pores, without stripping it of its natural oil. For dry acne prone skin, you don’t want to dry out the skin even more. The best mask for acne prone dry skin uses an ingredient you probably have in your medicine cabinet. Aspirin is actually a great ingredient to improve your skin’s condition. This is because it contains acetylsalicylic acid, which will help tighten skin and make your pores appear smaller. This will help reduce clogged pores, which helps prevent blackheads and whiteheads. You’ll need 1-2 drops of tea tree oil, around eight aspirin tablets and a little water. Simply crush the aspirin, and add the oil and water, enough to make the paste spread easy. Leave it on a clean face for 15 minutes. You can use this mask up to three times a week for best results. It’s often hard to treat combination skin, as your T-zone is oily while the rest of your face, your cheeks and chin can be dry. The key is to find the right mixture of the right ingredients to balance your face. Coconut oil and avocado are great for this as they’re both oil controlling and hydrating. The addition of tea tree oil will add an acne fighting boost. You’ll need 4 drops of tea tree oil, a tablespoon of coconut oil and a quarter of a ripe avocado. Mash up the avocado and then mix in both oils till the mixture is consistent. Massage the mask into your skin and leave for 15 minutes. You can use this mask up to three times a week for best results. Should I apply pure tea tree oil directly to my skin? Never. Essential oils such as tea tree oil are extremely potent. It’s not beneficial to apply undiluted essential oils of any kind to your skin, even tea tree oil. Applying pure tea tree oil to your acne could have the negative effect of irritating it further, rather than treating it as it should. If you’re buying pure tea tree oil, always dilute it with a carrier oil. Carrier oils are non-essential oils, such as coconut oil, which deliver the essential oil into the skin. You can get creative and make masks and treatments with other ingredients, such as honey or aloe Vera, to use on your skin. Should I apply it everywhere, or just to acne? Too much of a good thing can be harmful, and this includes skincare. It’s important not to overdo it when it comes to treating acne, and just like using tea tree oil in its pure form, using tea tree oil where it’s not needed can have an irritating effect on the skin. There are products out there that have smaller doses of tea tree oil, like cleansers toners and moisturisers which are suitable, and designed for, using all over the face, but if you’re using a home-made product or a more concentrated formula, always apply it to affected areas of acne. This is because tea tree oil is used to heal certain skin conditions like acne; and over use on healthy skin can cause irritation. How long will it be until I can expect to see results from using tea tree oil? As with any skincare product, you probably won’t see drastic results overnight. Don’t let this put you off though, as you need to use any new ingredient consistently to see real results. If you use a consistent routine that incorporates tea tree oil, you could see results as soon as in two weeks. However, every skin is different, and you should aim to use tea tree oil as an acne remedy for at least three months before you move on to something new; to give it a chance to get to work.